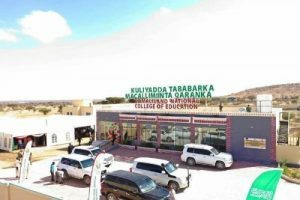 Somaliland: New National Teacher’s Training College Inaugurated. The Somaliland President Muse Bihi Abdi, accompanied by the Minister of Education & Science, Osman Aden Jama, and other dignitaries opened the new national teacher’s training college in Hargeisa. Speaking at the opening ceremony, the president paid tribute to all teacher’s across Somaliland, who are educating and moulding the future generations of the nation. The president also thanked the EU for it’s support of the new college, including, but not limited to the construction, but other educational tools, training instructors, bursaries, and the opportunity for further teacher training in overseas colleges. It is anticipated, when the new college’s (which sits on extensive land) development is completed, will be able to house up to 250 teachers of both gender, and will also include a new library, a recreation area, a conference centre, canteen and other facilities. Prof. Axmed Ismaciil Samar Oo Si Cad U Sheegay Inay Fashilantay Hoggaamintii Muuse Biixi, Wixii Laga Filaayayna Lagu Hungoobay. Sidee looga hortagi karaa dilalka ay Askartu u gaysato Bajaajleyda magaalada Muqdisho? Mudane Madaxweyne, Gebiley ma laha cashuuraha kastamka!